It is with a heavy heart that we said good bye to our mother, sister, grandma and great grandma, the morning of March 21, 2019. Barb was pre deceased by her husband Bill Jones. She is survived by her sisters, Jackie Devitt and Vicki Gibson, her children Gail Hill, Bob Jones (Shelley), Terry Harding and Laurie Jones, and her nine grand children, Barb Hill Watts, Mike Hill (Kelly), Kelly Stewart (Craig), Brittney Jones (Andrew), Alex Jones, Keith Harding (Priscilla), Julie Pause(Brendan), Dave Shortreed (Katie), Teri Buckley (Tim), and 14 great-grandchildren Juliet, Cole, Molly, Lucy, Finn, Sam, Ethan, Chloe, Parker, Jill, Cael, Oak, Georgia and Ruth. She will always be remembered for the happiness she shared with all of us at the Ilikai in Honolulu, especially the many evenings at the Chart House. 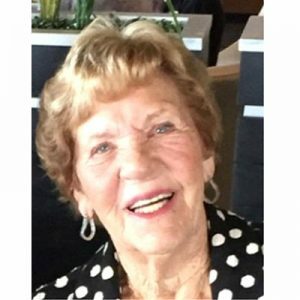 Her intelligence and acute business sense helped form a great partnership with her husband Bill as they built Lakeview Market into a thriving enterprise. To honor this remarkable woman’s spirit and tradition, consider toasting her with your favorite cocktail at precisely 5 pm. And not a moment before. At her request, a small family gathering will be held.